ORLANDO, FL – For many high school teachers, Homecoming Week is a week of fun filled stress. Each day is a different crazy dress up day where teachers don costumes that normal people wouldn’t be seen in out in public, much less seen in at work. These costumes become more outlandish it becomes realized that school spirit awards will be based on who has dressed the most spirited or “craziest” for the week and teachers all hope to win the coveted “most spirited” award. At Oak Ridge High School in Orlando, where I teach eleventh grade business law, we had a great Homecoming Week. We had “clique day,” where we dressed up like our fellow teachers, “tacky tourist day,” where we dressed up like…you guessed it…tacky tourists; “spirit day,” where we dressed up in school pride apparel and colors; “throw back Thursday,” where we wore our clothes of yesteryear, and “culture day,” where we got to express our favorite culture through our apparel. I thought about dressing in some outlandish wacky cultural costume that I knew I could win most spirited in, but then I realized this would be a great opportunity to gracefully share my culture, one that most of my students know nothing about. On culture day I wore my Armenian Coat of Arms t-shirt, red pants to represent the red in our flag, and carried the Armenian flag everywhere I went. 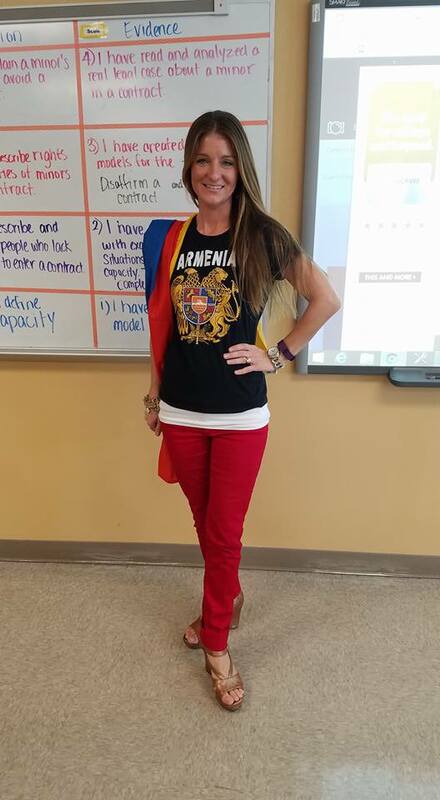 Many students, teachers, and other staff asked what culture I was representing and I had the opportunity to tell them all about Armenia and the wonders of our amazing culture. I have already talked about Armenia and Armenian culture with the students in my classes, so they were already knowledgeable; but this was a great opportunity for me to share our culture with our entire school of over three thousand students. I encourage you all to share our culture. Wear your Armenian colors and apparel. Don the Armenian jewelry and talk to others about our culture. In these times of fighting, war, and economic and political turmoil, stories of survival and perseverance are important for people to hear. So be proud and talk about our culture, we are an amazing culture with a wonderful story of survival and perseverance. Posted on October 12, 2016, in Arts & Culture, General Update and tagged Armenia, Oak Ridge High School, Orlando, Sarah Suzanne Kechejian Dinquel. Bookmark the permalink. Leave a comment.